This was a great challenge, it made me play with my camera and learn more about it! I didn't even know I had a Monochrome setting on my camera, let alone two settings, one for sepia tones and one for high-contrast black and white. So here's a sepia toned one, this is Quieto the horse, with Doug the dog in the background, waiting to go for a trek. I'm not that crazy about the sepia mode, to be honest, the softness of the images irritates me. 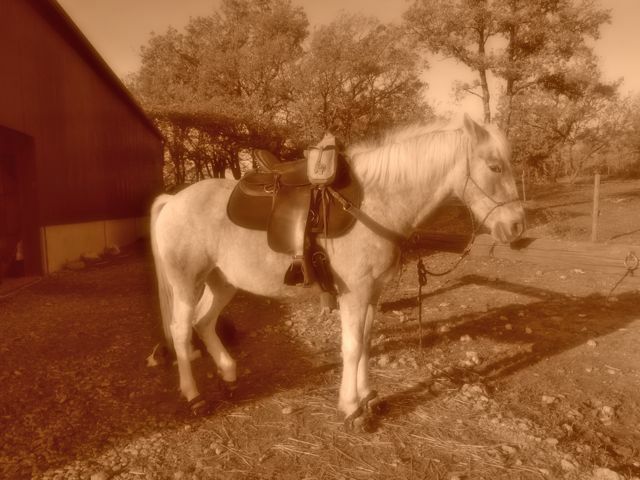 However, I do think that this guy all tacked up in his Western gear is the perfect subject for sepia. After that, I focussed on one of my dogs (pun intended! ), Cookie. Cookie is a hyper-terrier - she's a Jack Russell/Whippet cross. Yes, her ears really are THAT big! She's the ultimate wannabe hunter. 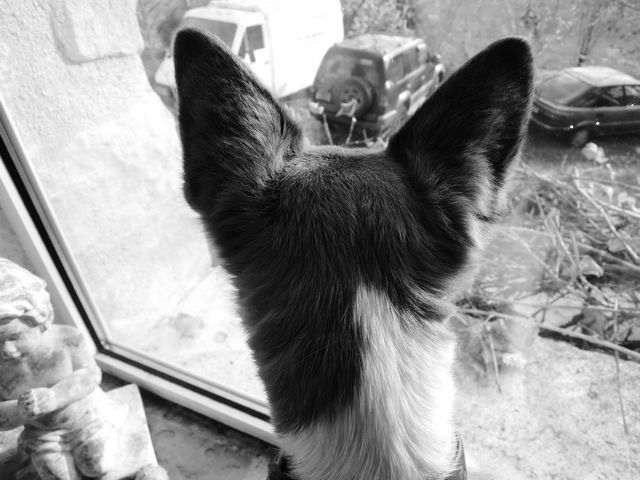 There are free-range chickens and cats roaming around the area where our house is, and she spends her day sitting at the window, watching them and, presumably, plotting schemes whereby she might manage to catch one, a bit like Wile E. Coyote. I was trying to get her to pose, and she starting practising her killing skills on my hand. My, what big teeth, you have, Cookie! Sunday Stills is a place to hone your photography skills. Each Week Ed issues a new “Challenge” that gives us the opportunity to pick up what ever kind of camera we own and try and meet it. Sometimes we’ll look forward to it because it might seem fun and easy and sometimes we might have to rack our brain to get the appropriate shot to meet the assignment requirements. The purpose is to get out there and use our cameras. Drop over to Sunday Stills and have a look! Lovely shots. I've alway felt the same way about the sepia, but Quieto does do it justice. Love the last shot. Nice shots--made me go find some fresh batteries for my old SLR. I'm still on the hunt for a new affordable, but really good digital camera (I'm really picky about what I want). You've re-inspired me. Now I'll check out Sunday Stills! Great photos. Love Cookie's big ears and teeth. She is so fierce the chickens and cats should be afraid of her plotting. 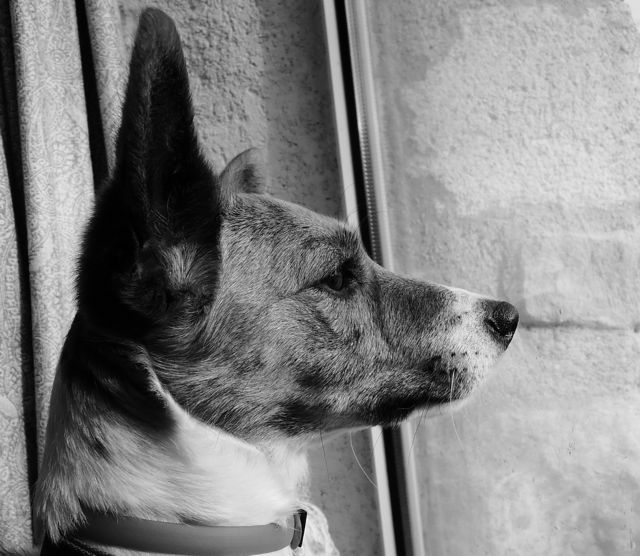 Love those big ears, so much easier to see what she is focused on. I really like the sepia look, but I does depend on the subject. Very cute dog, and those ears are adorable. It's always fun to figrure out new things about our cameras. Great shots. What a sweet looking dog. LOL, folks, she's not sweet, she's really naughty.... check out "Cookie versus the Tree" or "Cookie versus Hedgehogs" on the RH sidebar! But we love her anyway, someone has to. I love your shots of your terror um terrier. 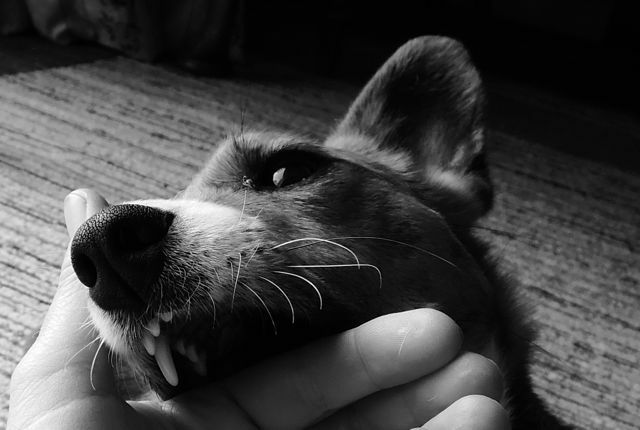 Her markings (and teeth) are perfect in black and white. I agree about the sepia, I don't find too many things that look good with it but yours does! Love the photos of Cookie, she looks incredibly smart!! Adorable ears! Your photos are amazingly sharp!